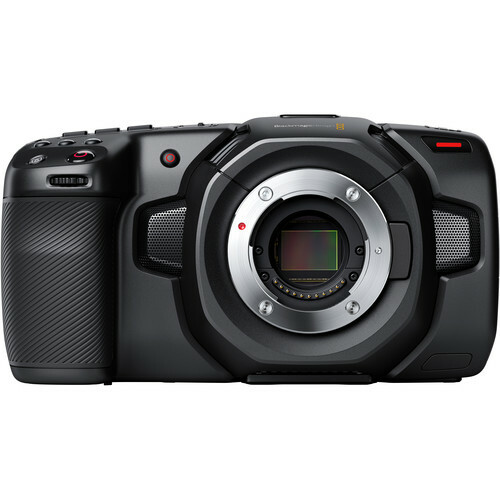 The Blackmagic Design Pocket Cinema Camera 4K features a 4/3" sensor for capturing up to 4096 x 2160 DCI 4K images at rates up to 60 fps in a variety of codecs including CinemaDNG Raw/Raw 3:1/Raw 4:1, and various ProRes 422 options. Slow-motion rates up to 120 fps are available in cropped Full HD. Its Micro Four Thirds lens mount accommodates the original, lightweight Pocket Cinema Camera lenses, and can be used with PL, C, EF, and other lenses with the use of separately available adapters. A dual-native ISO up to 25,600 is featured for low-light capture, and 13 stops of dynamic range provide rich HDR images.